This new Hubble image shows elliptical galaxy NGC 2768. Like a lighthouse in the fog, the luminous core of NGC 2768 slowly fades outwards to a dull white haze in this image taken by the NASA/ESA Hubble Space Telescope. 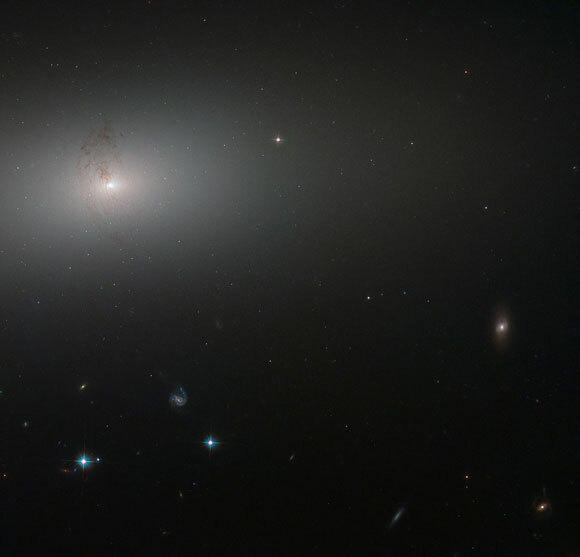 NGC 2768 is an elliptical galaxy in the constellation of Ursa Major (The Great Bear). It is a huge bundle of stars, dominated by a bright central region, where a supermassive black hole feasts on a constant stream of gas and dust being fed to it by its galactic host. The galaxy is also marked by a prominent plume of dust reaching out from the center and lying perpendicular to the galaxy’s plane. This dust conceals a symmetrical, S-shaped pair of jets that are being produced by the supermassive black hole as it feeds. Be the first to comment on "Hubble Peers Through the Luminous Core of NGC 2768"